No matter how large or small, Jilly takes a custom approach with every event, carefully considering your needs. She thoroughly researches your company in order to truly speak to your audience and personally tailors her presentation for your event—often serving as the comic relief to lighten and liven things up. Jilly’s speaking engagements include conventions, dinners, luncheons, conferences and more. See Jilly’s client list and testimonials or contact Jilly for a complimentary consultation and price quote. 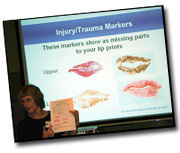 Jilly Eddy presents the Art and Science of Lip Print Reading at the International Behavioral and Medical Biometrics Society 2007 Conference, in Budapest.